Suffering is usually described as a negative basic feeling or emotion that involves a subjective character of unpleasantness, aversion, harm, or threat of harm. 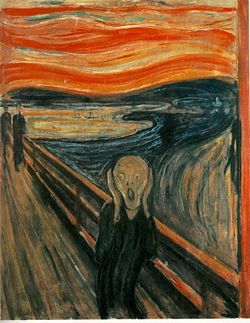 The Scream by Edvard Munch has become a symbol of the mental suffering of modern man. Suffering may be said to be physical or mental, depending whether it refers to a feeling or emotion that is linked primarily to the body or to the mind. Examples of physical suffering are pain, illness, disability, hunger, poverty, and death. Examples of mental suffering are grief, hatred, frustration, heartbreak, guilt, humiliation, anxiety, loneliness, and self-pity. Attitudes towards suffering may vary hugely according to how much one deems it to be light or severe, avoidable or unavoidable, useful or useless, of little or of great consequence, deserved or undeserved, chosen or unwanted, acceptable or unacceptable. Physical suffering can often be ameliorated by medical, political, and economic measures that can alleviate disease and poverty and put an end to conflicts and wars. Mental suffering persists, however, even in the most ideal physical circumstances. Even as regards to physical suffering, science offers no cure for the ultimate physical suffering—death. Suffering is endemic to the human condition, and the ways people address suffering go far in determining the course of their lives. People can be defeated and embittered by suffering, or they can use their suffering to spur them on to a successful life. Awareness of the suffering of others can motivate charity and a life of public service. Some people even take suffering on themselves in order to relieve the suffering of others. Suffering can also lead to realizations about the purpose of life and open a door to transcendence. The field most concerned with understanding suffering, its causes, meaning and significance, and how it can be remedied, is religion. The religious traditions in response to the "why" of suffering have developed diverse understandings over the centuries. What follows is a catalog of religious and philosophical perspectives on suffering, its meaning, and how people deal with suffering. Although it may seem commonplace to recognize that suffering is everywhere, to truly recognize this fact can help a person de-center from his own suffering and recognize that he suffers with all humanity. This can alleviate the frantic self-absorption that comes with suffering, which can at times be overwhelming. The Noble Truth of Suffering (Dukkha) is this: Birth is suffering; aging is suffering; sickness is suffering; death is suffering; sorrow and lamentation, pain, grief, and despair are suffering; association with the unpleasant is suffering; dissociation from the pleasant is suffering; not to get what one wants is suffering—in brief, the five aggregates of attachment are suffering (Samyutta Nikaya 56). When Shakyamuni Buddha lived in the palace, he famously encountered scenes of four kinds of suffering: Poverty, disease, old age, and death. These experiences affected him deeply, spurring him to seek answers to the question, "Why do people suffer?" It was the beginning of his journey to enlightenment. Once a distraught young mother, Kisa Gotami, came to the Buddha clutching the body of her dead child and asked him for the medicine that would cure the boy. The Buddha told her to procure some mustard seed, but it must be from a house that has never known the death of a family member. Of course, Kisa could not find such a house. She sat by the road, exhausted, when it finally hit her that she had been exceedingly selfish in her grief. She recognized that deeper than her grief was the selfishness that caused her to fasten upon it. At that moment she became a follower of the Buddha. The lesson from this is to be resigned to life's ups and downs, knowing that just as the seasons change from spring to summer, fall and winter and then again to spring, hard times are bound to give way to better times, today's grief to tomorrow's hope. Accepting that life moves in cycles in which the good times and the bad times are balanced helps one to face life's vicissitudes with equanimity. It also helps one not to believe overconfidently that the good times will last forever. A related approach is to see suffering as unreal, but only a result of one's mental attitude. Suffering is derived from being too attached to what is passing. All that is real is what is permanent not what is changing. This "permanent" reality may be called "soul" by some; self, by others; God, by still others. In ignorance people hold fast to the sense impressions of the external world; hence they suffer. But by casting off ignorance, we can behold the unchanging Reality that is beyond all suffering. To realize that down deep, where the real "me" is, there is no suffering, is to go beyond all suffering—to be a reality which stands still and there is no difference between past, present, and future. The Lord supports this universe, which is made up of the perishable and the imperishable, the manifest and the unmanifest. The individual soul, forgetful of the Lord, attaches itself to pleasure and thus is bound (Svetasvatara Upanishad 1.6-8). To be enlightened is to see through this illusion and grasp the true unchanging Self that lies within. Then all attachments to the world fade away, and there is no longer any cause to suffer. All the objects that elicited physical and mental torment are no longer to be found. This Western perspective sees each person's life as moving in a definite and very personal direction due to many causes and reasons, some known but most not. Personal history takes a direction resulting from the interplay of our freedom, loving, and working with the total environment. Unlike the Eastern views mentioned above, we humans are very much our body, our changing emotions, and our relationships. We would be nothing without these dynamic and enfleshed realities. The "why" question is very important to those who approach life from this perspective because its answer indicates to them the direction of their future and the reasonableness of their suffering. Suffering must fit into something more than one's self. This something may be titled history, providence, or God's will. This viewpoint of suffering does not lead to fatalism. It says that people are responsible at every moment to make use their free will to make good choices. The choices people make are like forks in the road; they have both short-term and long-term consequences for good or ill. People may suffer in dealing with the consequences of previous bad choices, but they can always make a better choice the next time. I do not understand my own actions. For I do not do what I want, but I do the very thing I hate… I can will what is right, but I cannot do it. For I do not do the good I want, but the evil I do not want is what I do. Now if I do what I do not want, it is no longer I that do it, but sin which dwells within me. From this perspective, the key to eliminating conflict and suffering in one's social world is to first overcome the war within. The task of gaining mastery over oneself is very difficult, yet it is essential. A person with a unified self can find happiness and fulfillment in relationships with others, because he or she will always act for the other person's benefit. Such people are lights of peace and contentment for their families and friends. Sin means to be out of alignment with the will of God. Certainly, having a conflicted self means that one is in a state of sin. But sin is a broader concept, which depends greatly on the religious context from which it is viewed. Sin can be an action that violates God's commandments (Judaism), including crimes and hurts against other people or violations of religious duties that violate the covenant relationship with God. There are verbal sins—lying, slander, gossip, and so on—which damage reputations and destroy trust. There are also mental sins—lust, greed, covetousness, hate, and so on—which turn the heart away from God and lead to sinful actions. When sin is viewed broadly, there is almost no one who is without some sin. "If we say we have no sin, we deceive ourselves, and the truth is not in us" (1 John 1.8). Sin leads to punishment, which entails suffering: "Do not be deceived; God is not mocked, for whatever a man sows, that he will also reap" (Galatians 6.7). Suffering considered as punishment highlights the judgmental character of a personal God. People suffer because they or others have sinned. Suffering is a way of righting the imbalance of evil over good. As Rabbi Ruba (1500 C.E.) said, "If a man sees that painful suffering visits him, let him examine his conduct." This approach is found in many prayer books of classic religions. In theology, there is a classical problem called the problem of evil: It deals with the difficulty of reconciling the existence of an omnipotent and benevolent God with the existence of evil, of which extreme suffering is often considered one of the worst kinds, especially in innocent children, or in creatures tormented in an eternal hell. Within the Bible, the Book of Job is widely regarded as a profound poetical reflection on the nature and meaning of suffering. But classic religion is not alone in such an approach: The blood of many people flows in reparation for the sins of their colonial forefathers; a woman in public office is hounded for an offense committed in her teens; those who commit crimes against society are punished for past deeds. The model of suffering as a punishment for wrong doing is evident to anyone who makes a child suffer because of some misdeed. It is a short step to complete the circle and ask of the sufferer what he or she has done wrong because suffering is supposedly always linked to wrong doing. As a Sufi saying has it, "When you suffer pain, your conscience is awakened, you are stricken with remorse and pray God to forgive your trespasses." In some religious viewpoints, sin is more than just an accounting of personal misdeeds; it is an intractable state of disability that is deeply rooted in the human condition and beyond human power to remove. This is evident particularly in the Christian teaching of original sin. This was the sin committed by the first human ancestors at the Fall of Man. Most Christian theologians agree that original sin has left the human race in a depraved condition, far away from God's original ideal for human beings, who were meant to flourish in continual grace and love. Catholics and Protestants differ only over the degree to which sin has tarnished the original goodness of humanity prior to the Fall, whether some goodness still remained or whether humans were left totally depraved. Either way, the consequence of original sin has been unending misery, a pit from which no one can escape by their own efforts. Only God, through the providence of salvation, can provide a way for human beings to return to their original status before the Fall. Until that salvation appears on earth, suffering remains the endemic state of humanity. The hopeful side of this doctrine is that with the coming of the Messiah, who removes the original sin, it will be possible for a redeemed humanity to live in an ideal world free from suffering—what is called the Kingdom of Heaven. Suffering can be an instrument for training, part of each person's course to maturity. It is reflected in the common saying, "No pain, no gain." In any discussion of suffering this way, understanding the "why" of suffering comes to the fore as people tell one another that few good things are produced without pain or as people ask how they can develop into mature persons without suffering. The belief is that suffering is an instrument, sometimes sharp, sometimes blunt, of individual and communal development. as a father the son in whom he delights (Proverbs 3:11-12). 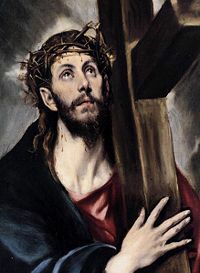 Saint Paul praised suffering, noting that "suffering produces endurance, and endurance produces character" (Romans 5:3). The Buddhist saint Shantideva compared suffering with the sometimes painful surgery or remedies prescribed by a doctor to cure a much graver illness (Guide to the Bodhisattva's Way of Life 7:22-24). Suffering of this type is found in the phenomenon known as the Dark Night of the Soul. where an individual loses all sense of purpose and feelings for their religious life. Deep suffering occurs as the individual seeks to make her or his way in a life seemingly without direction, overwhelmed by the feeling that what formerly made sense no longer exists. Nevertheless, for the person who perseveres with faith, there is a light at the end of the darkness and a new and deeper realization results. Suffering can likewise be an instrument for realizing the greater purposes of God. Such is the Islamic belief that suffering is an instrument of God's purposes, through jihad, which means to "strive in the way of God" (Qur'an 5:35) amidst persecution, poverty and oppression: "We will test you with a bit of fear and hunger, and a shortage of wealth and souls and produce" (Qur'an 2:154). Jesus taught his followers to "deny themselves and follow me" (Matthew 6:24), and not be anxious about food or clothing, but instead to "seek first God's Kingdom and his righteousness" (Matthew 6:31-33). A personal God uses believers who are willing to suffer to bring about his goal for humanity. On the other hand, there is nothing righteous about assuaging one's suffering by taking revenge. Whatever satisfaction the wronged person may feel from gaining the object of his or her vengeance, it is a satisfaction that is entirely self-centered. Meanwhile, the hurt committed in the taking of revenge only multiplies the suffering of others, and may set off a vicious and long-lasting feud. The belief in suffering as redemptive is found in many stories and songs: Someone takes upon himself or herself the sins and burdens of others so that all will be free of the consequences of sin. In this view, whenever anyone suffers so that others may live, redemption occurs. The prophets of Israel make this clear in describing the role of the Babylonian captivity in the nation's life. Isaiah summarized it when he said: "By his suffering shall my servant justify many, taking their faults on himself." John's Gospel applies this same principle to Christianity when John the Baptist claims that Jesus is the one who takes away the sins of the world (John 1:29). Many Christians bear with suffering, comforted by the belief that they will find ease and satisfaction in the afterlife. For instance, African-American slaves sang hymns like "Swing Low, Sweet Chariot," longing for the day when they depart from their earthly toil under the slave-master's whip to a home of peace and rest beyond the "Jordan River." Believers living in impoverished and oppressed communities have found a shred of hope in their belief after enduring hardships they could at least find a future home of heavenly rest. However, this identification of suffering with the next world has its down side. For one thing, it can justify passivity and resignation to injustice, an idea famously put in Marx's dictum, "Religion is the opiate of the people." Indeed, the prophets and righteous people of every tradition have challenged their societies to eliminate injustice and alleviate suffering in this world. If one looks at the major world religions, one sees a holistic commitment to the alleviation of suffering. Another difficulty with this answer is that poverty and oppression does not automatically lead to a comfortable afterlife, if by living under such conditions the people become embittered and resentful. Beliefs in the afterlife generally hold that a person's destination in the afterlife is determined by their heart and character, and their deeds on earth. In spiritualist accounts of the afterlife, victims of murder who die with hearts full of resentment against their killers may find themselves in the same hell; the killers and their victims bound by chains of hate. It takes considerable faith and strength of character to keep a forgiving and peaceful mind in conditions of mistreatment and oppression. A third difficulty concerns those who glory in their suffering, thinking that it will buy them a ticket to heaven. Some Christian and Islamic martyrs have such a concept; they think that by dying they will automatically merit a place in Paradise. Yet the higher religions teach that the intention behind a person's action determines its value. Actions are but by intention and every man shall have but that which he intended. Thus he whose migration [the exile to Medina] was for Allah and His messenger, his migration was for Allah and His messenger, and he whose migration was to achieve some worldly benefit or to take some woman in marriage, his migration was for that for which he migrated (Forty Hadith of an-Nawawi 1). Even so, the martyr who suffers and dies for God's will and the martyr who dies for his own glory end up in two different places in the spirit world. The converse position to those who see life's suffering as the consequence of sin or working out of a plan is to say that life is absurd. Death is absurd. Existentialists like Jean-Paul Sartre and Albert Camus have taken this position. When faced with the enormity of suffering and death caused by war or natural disasters, these thinkers are unable to conceive of a God who would make such a horrific plan for his creatures. No rational weighing of sin and punishment for sin can comprehend the suffering of the Holocaust, for example, and no concept of a God who controls human life and destiny can comprehend it, except to conclude that God is a monster—yet that is also absurd. Since there is no meaningful way to comprehend the suffering of life, they conclude that human existence has no larger meaning; that it is absurd. Therefore, people are left to create their own meaning, in the teeth of life's absurdity. By taking a stand, people prove that they can beat life's absurdity. To be human and alive is to thumb one's nose at the boredom, absurdity, and stupidity of life itself and any of the suffering inherent in living it. The ancient myth of Sisyphus is a good example of this response. The story is told that Sisyphus was condemned to push a large boulder up an enormous mountain. Through rain, snow, sleet, cold, and hot, he strained to get the boulder to the top of the mountain. Day after day, night after night his only goal was to push the boulder to the top. Strained muscles, scraped knees and arms, bruised shoulders and face, did not stop him. Every day he pushed. Every day he inched his way to the top. Then one day he reached the top. In exultation, he paused in triumph. While he paused, the boulder rolled down the mountain. His eternity was to push the boulder to the top. His humanity was to look from the top of the mountain at the boulder below and with shoulders square, turn to begin again. Every religion demands right living from its members. Right living looks toward the diminution of suffering by erasing its immediate cause. It sets the stage for a world free of the suffering caused by humans. Judaism, for instance, has given people many principles of justice and concern. The statement of God in Hosea 6:6, "… what I want is love, not sacrifice," sets the prophetic theme of justice and love for all. And Nathan's statement to David, "You are the man" (2 Samuel 12:7), that is, he is responsible and accountable to God for the suffering you cause, places the burden upon the individual to relieve suffering. The Christian's obligation vis-a-vis suffering is found both in Jesus' words on the Sermon on the Mount (Matthew 5:1-12 and Luke 6:20-26) and in his example in healing the blind, the lame, and the deaf. Islam's Five Pillars includes a direct attack on poverty and demands the giving of alms. As the Koran says, "Did he not find you wandering and give you guidance? As for the orphan, then, do him no harm; as for the beggar, turn him not away" (Smriti xciii). For the Hindu, right living consists in specifying duties for each state of life. If lived, they decrease the suffering in the world. In essence, one should cause harm to no one. Buddhism and Hinduism find a common bond in a compassion that seeks unity with the suffering of others in order to destroy all suffering. Liberation from suffering is considered essential for leading a holy life and attaining nirvana. Religions also offer many means of engaging the emotions surrounding suffering and death. This engagement of the emotions is found especially in the tradition of "devotion," and of "mystical union." Not everyone within the various religions engages in these two traditions but they are present in most religions. "Devotion" is prayer and a lifestyle committed to a significant religious figure—for example, Krishna or Jesus. Prayer is a communication with this most significant religious figure. Human suffering takes on a meaning because of one's relationship to this significant religious figure. At the same time one's consecration to him or her opens up patterns of endurance, compassion, and forgiveness because one wants to base his or her life upon the object of devotion, who has also suffered. "Mystical union" is consecration brought to completion by accomplishing oneness with the ultimate in our life. This can be seen in the Eastern religions, where the ultimate identity of each person is found in the permanent (Brahman); or in the Far East, in Tao, where one can reach an inner perception of and unity with Tao. The union is with that which is beyond the here and now. In the union, there is no suffering. Religious rituals typically comfort sufferers and help put them in a more positive frame of mind. To deal with death, there are rituals surrounding the preparation of the disposal of the body, rituals associated with the days and/or weeks following the death, and prayer rituals within the gathering of the community petitioning for health or comfort. Ritual action copes with suffering in many ways: For example, by enlisting the support of the religious community as in Jewish mourning practices of Shiva or the Catholic Mass; or by placing the sufferer in a positive frame of mind by putting them in contact with their ultimate concern and consequently relativizing the suffering. There is great power in connecting one's personal suffering with the greater suffering of humankind, or of one's people or nation. That identification gives one's suffering meaning, and offers the possibility of solidarity with the highest good. Jesus told his disciples, "If any man would come after me, let him deny himself and take up his cross and follow me" (Matthew 6:24). Christians who live by this dictum willingly take upon themselves suffering like that which Jesus Christ endured, suffering persecution, ridicule, and ostracism to spread the Gospel. Soldiers who go to war and patriots who take the path of martyrdom feel the same way: They find it the highest honor and greatest value to suffer and die to defend their nation. I have been crucified with Christ; it is no longer I who live, but Christ who lives in me; and the life I now live in the flesh I live by faith in the Son of God, who loved me and gave himself for me (Galatians 2.20). The bond that such believers have with Jesus Christ is far deeper that that of armchair Christians who lead an affluent life and only go to church on Sundays. Or do you think that you shall enter the Garden without such trials as came to those who passed away before you? They encountered suffering and adversity, and were so shaken in spirit that even the Apostle and those of faith who were with him cried, “When will come the help of God?” Ah! Verily the help of God is always near (Qur’an 2.214). but they did not know that I healed them (Hosea 11:1-4). The great Jewish sage the Baal Shem Tov once wrote, "Pray for the heaviness that is the Head of the world." and "Pray continually for God's glory that it may be redeemed from its exile." Among the contemporary spiritualities, experiencing God's suffering through prayer and personal suffering is central to the spirituality of Sun Myung Moon's Unification movement. Religion, when it is authentic to itself, is a direct aid in the reduction of suffering. Sometimes, however, it may intensify the suffering when its role is misunderstood, its devotees closed to the exercise of compassion, or it is used to advance the power of individuals and or groups. Religion can be the cause of war, and wars cause suffering. Alienation results when, because of conviction, one abandons one’s birth religion. Consequently some parents or children disown the other because of their new religious allegiance. This also occurs when one begins to interpret and live the religion differently than the majority. Therefore, it is best when religious conviction is accompanied by tolerance and humility to the ways God may be working through other paths. Suffering in philosophy and ethics is addressed in the study of Epicurus, Stoicism, Arthur Schopenhauer, Jeremy Bentham, Utilitarianism, John Stuart Mill, Friedrich Nietzsche's On the Genealogy of Morals, Humanitarianism, Negative utilitarianism, Peter Singer, Richard Ryder’s Painism, and the Philosophy of pain. In the social sciences, suffering is increasingly a concern in fields such as medical anthropology, ethnography, mass media analysis, and Holocaust studies. Ralph Siu, an American author, urged in 1988, the "creation of a new and vigorous academic discipline, called panetics, to be devoted to the study of the infliction of suffering." The International Society for Panetics was founded in 1991, and is dedicated to the study and development of ways to reduce the infliction of human suffering by individuals acting through professions, corporations, governments, and other social groups. In economics the question of suffering is addressed by the topics of Well-being or Quality of life, Welfare economics, Measuring well-being, Gross National Happiness, and Genuine Progress Indicator. "Pain and suffering" is the term used in the field of law to refer to the mental anguish and/or physical pain endured by the plaintiff as a result of injury for which the plaintiff seeks redress. Biologists are investigating the brain structures and processes associated with suffering. For instance, neuroimaging reveals that the cingulate cortex fires up when unpleasantness is felt from social distress or from physical pain that are experimentally induced. This finding led recently to the pain overlap theory, which proposes that physical pain and social pain share a common phenomenological and neural basis. According to David Pearce’s Hedonistic Imperative, suffering is the result of Darwinian genetic design, and it can be abolished. BLTC Research and the Abolitionist Society promote replacing the pain/pleasure axis through genetic engineering and other scientific advances. ↑ World Scripture: A Comparative Anthology of Sacred Texts (New York: Paragon, 1991), p. 220-22. ↑ Ian Wilkinson, Suffering—A Sociological Introduction. ↑ Ralph G.H. Siu, "Panetics—The Study of the Infliction of Suffering," Journal of Humanistic Psychology 28/3 (Summer 1988). ↑ American Academy of Orthopedic Surgeons, Glossary. Retrieved March 4, 2007. ↑ Naomi Eisenberg, Princeton University website. Retrieved March 4, 2007. Ham, Ken and Sarafati, Dr Jonathan. Why is there death and suffering? AnswersinGenesis.org. Braybrooke, Marcus. 2002. Religion-online.org. What can We Learn from Islam: The Struggle for True Religion. Leventry, Ellen. 2007. Beliefnet. Why Bad Things Happen:How different religions view the reasons for undeserved human suffering. BLTC Research. 1995. Life in the Far North:An information-theoretic perspective on Heaven. This page was last modified on 24 October 2015, at 14:51.